Find the right courses for you to study by looking at our courses. Come along to one of our Open Days to find out more about the courses, meet tutors and take a tour of our building. You can apply to study with us without coming to an Open Day but we would recommend visiting us if you can. The dates for our 2017/18 events can be seen on our Open Days page. You can apply from the beginning of October 2017 by completing the application form or via UCAS Progress. Your careers adviser at school will be able to help with your application should you need it. After you’ve applied you will be invited in to college to attend an interview with a tutor. Interviews take place on Wednesday afternoons and you will receive a letter advising you of the date and time that yours will take place. We work closely with schools and they are aware of our interview process so there should be no problem in taking time out of classes. The interview is nothing to worry about; it’s very informal and is a great chance for you to ask any questions you might have about your choice of A Levels. After your interview you will be offered a place on your chosen programme, usually conditional depending on your GCSE results, or referred to a more appropriate course. All A level applicants will be invited to our Step up to Sixth Form taster day in June 2018. 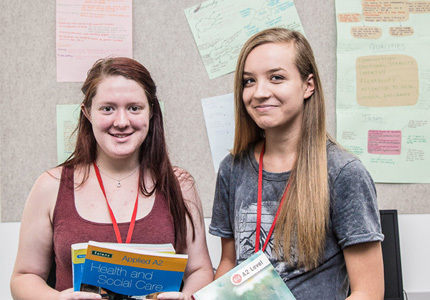 This full-day session will give you a chance to meet some of your fellow students and tutors and get a taste of life at Barnsley Sixth Form College. An invitation and enrolment pack will be sent to you in early August 2018 giving you all the information you need ready to enrol at the end of August.